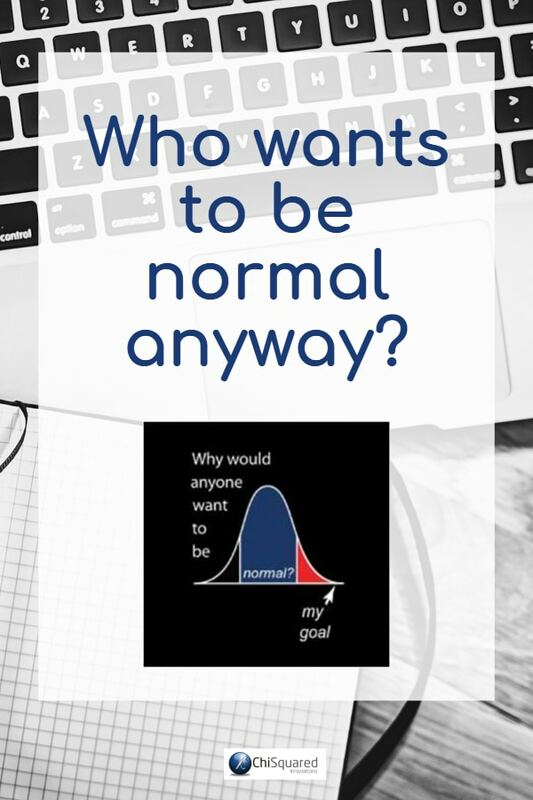 Who Wants to be Normal Anyway? When I heard this live on BBC News 24, I almost fell off my chair. Even with the most rudimentary understanding of data and statistics this is a really stupid thing to say - and these are the people that are running the country (allegedly)! This politician - name withheld to protect the idiot (also because I can’t remember who it was) - clearly didn’t have a clue what he was talking about, but he said it with such passion and conviction that the interviewer probably didn’t even notice. Or maybe he was just sniggering quietly inside. 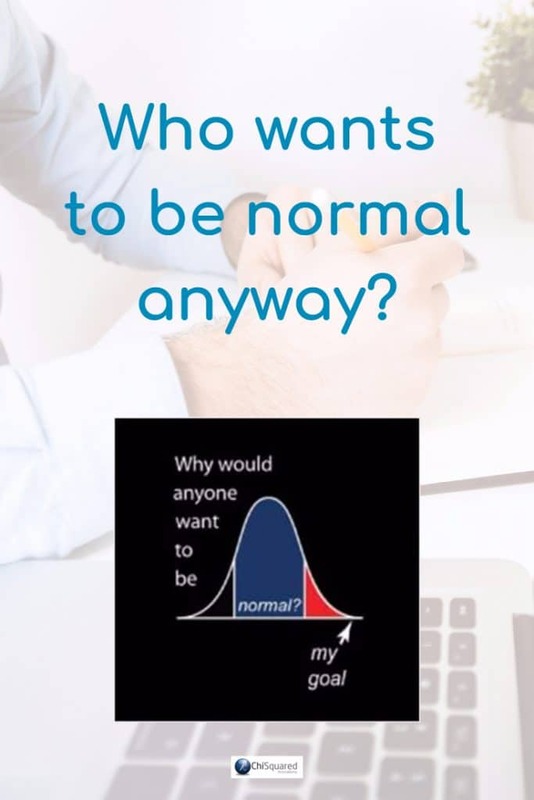 To understand why the lovely politician was so wrong, we ought to take a look at the ‘Normal’ distribution, find out how you get one and what you do with it. I know what it’s like when somebody talks about distributions - your brain goes into stand-by mode and your eyes glaze over. But stick around a little while - we’re going to look at this from the point-of-view of visualising data, not using complicated calculations and confusing stats. Let’s take the example of the heights of school kids to find out how a ‘Normal’ distribution comes about. Imagine that you go to your local school and took all the kids out of their classes (don’t actually do this - you might get arrested!). Measure their heights and write each measurement on a tennis ball (different tennis balls, not the same one…). Let’s say the shortest pupil is a little over 0.9m and the tallest is a little under 1.9m. Now take 10 dustbins (if you're reading this over the pond - trash cans) and line them up next to each other in front of the playground wall. Write ‘0.9m to 1.0m’ on the left-most bin, ‘1.0m to 1.1m’ on the next bin, and continue to do this in 0.1m increments until you reach the last bin; ‘1.8m to 1.9m’. Now try and persuade the little darlings to put the balls into the correct bins - a difficult task, I know, but who said being a statistician was easy? 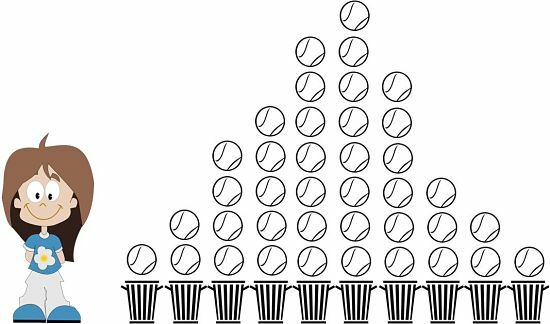 The ball labelled with 1.21m goes into the ‘1.2m to 1.3m’ bin, the ball with 1.76m written on it goes into the ‘1.7m to 1.8m’ bin, and so on. Count the balls in each bin and then paint dustbin lid-sized tennis balls above each of the bins - one for each ball counted (i.e. for each pupil). If there are a lot of school kids, we can paint one ball for each ten pupils. As you can see, the average pupil height is right in the middle - whichever measure of ‘average’ you use - and their heights are distributed equally and symmetrically each side of the centre. There isn’t a standard number of bins to use when sampling data like this, but usually the number of bins to use increases with the amount of data we have. I hope you can see that as the amount of data and number of bins increases, the smoother the curve becomes, so if you want to describe your data accurately you should collect lots of data. 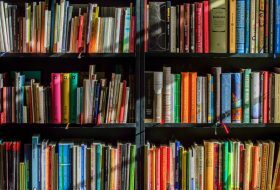 OK, so now we know what a Normal distribution is and how to recognise it, but what can we do with it? Well, for a fixed amount of data that is normally distributed, the general shape of the bell curve doesn’t change, but it may get taller and thinner or shorter and fatter. Have a think about that for a moment - if you take a single class of pupils they’ll all be the same age and will likely all be of a similar height. The heights will have less variation - the difference between the shortest and tallest will be relatively small (the distribution will be narrow) - and there will be more pupil heights closer to the centre (the distribution will be taller). On the other hand, if you take pupils from all classes in a school there will be a broader range of ages and greater variation in the heights. More pupils will be found in the tails (away from the centre) and fewer grouped around the average making for a broader and shorter distribution. So the width and central point of the distribution can tell you a lot about your data. Let’s compare the heights of kids at 2 well-known fictional schools. OK, so you know the drill by now - it’s exactly the same as before. You follow this drill for both Hogwarts and St Trinians. These bell curves don’t overlap very much. There’s certainly no overlap in their central portions, but there may be a small overlap in the tails. This tells us that there is likely to be a real difference in heights between the pupils at these 2 imaginary schools. So now we know how to use bell curves to compare different groups in a descriptive way, but how about trying to put some numbers onto this to give us a better ‘feel’ for what is going on in the data (I’m not going to go into statistical tests, significance, confidence or p-values here - I’ll leave these for a future post). We know that the width of the bell curve is important, so let’s try to measure it. If we take our data and line it up from smallest-to-largest, we can take the middle value to represent the centre of our data; the average height of the pupils at this school. I’m sure you recognise this - it’s called the median. Now we have split our data in half, with exactly half of the pupils shorter than the median and half taller. If we now take the middle value (median) of the bottom half of the data and do the same with the top half, we have now split our data into 4 parts with equal numbers of pupils in each quarter. The central points of the lower and upper halves are called the 1st and 3rd Quartiles, often abbreviated as Q1 and Q3. The 1st and 3rd Quartiles give you a good ‘feel’ for the width of the data distribution. 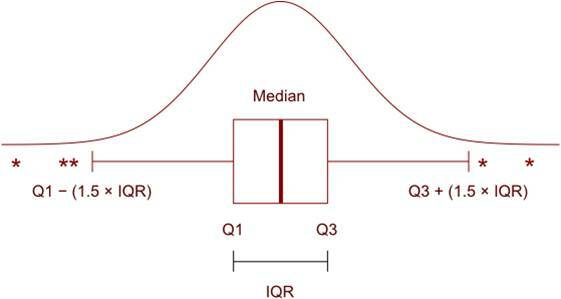 For a Normal distribution, Q1 and Q3 are equidistant from the median, but their distance from the median can vary when the data are not symmetrical (non-Normal). I think you can see that these measures would be very useful to show on the Histogram so that we can get a better understanding of pupil heights. When we plot these values we can immediately identify values that ‘fit’ within our dataset and the outliers that don’t. So now we have a way of representing our data with a single image that is constructed from a few simple calculations on our data - the Box and Whiskers Plot. By looking at the distribution of the heights of pupils at each of these schools in the Box and Whiskers Plots it becomes really easy to see what the average pupil heights are, and that the middle half of measurements for both schools are very different. 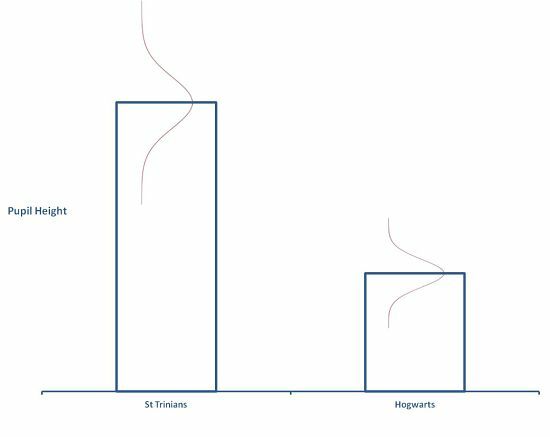 In fact, more than 3/4 of school kids at Hogwarts would be considered as extremely short if they studied at St Trinians instead (not that they ever didany studies at St Trinians…). So I hope that we can all agree now that the Normal distribution is, er, well, normal, and not something to be afraid of. 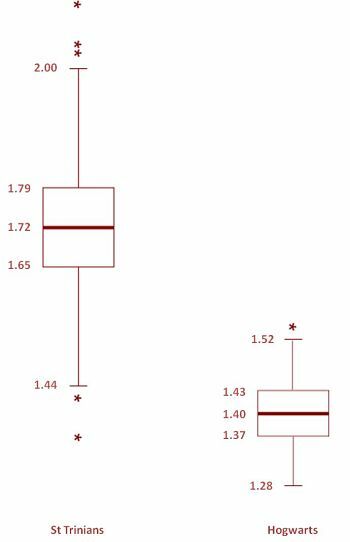 It is easy to understand and simple to represent with numbers and a Box and Whiskers plot to get some real insights into what your data is trying to tell you. 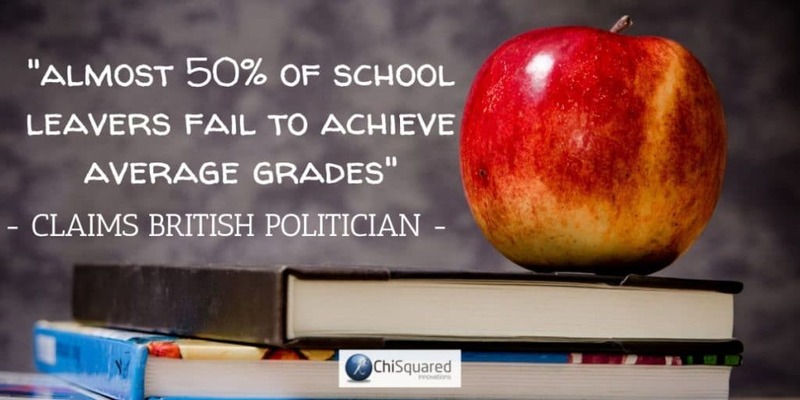 And to come back to the earlier point about the idiot politician and his ‘almost 50% fail to achieve average grades’ comment - I hope you understand why it was ridiculous. The average represents the middle of the distribution. 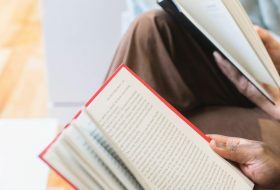 By definition, 50% of the values lie below the average, so there will always be almost 50% that fail to achieve the average no matter what the average value is. 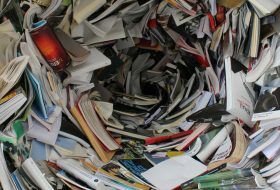 Statistics – The Last Dark Art?